Reserved Seats – $13, $23, $33, $43, $58, $83, $108 (plus applicable service charges) (prices increase $5 day of show) Tickets available at the Verizon Arena Box Office, charge by phone at 800-745-3000 or on line at www.ticketmaster.com. Groups of 15 or more, please contact our group sales office at 501-975-9131 or email jflynn@verizonarena.com. Every PBR event begins with pyrotechnics, explosions, and flames. The action heats up when the top 35 bull riders in the world face off against the fiercest bucking bulls on the plant. 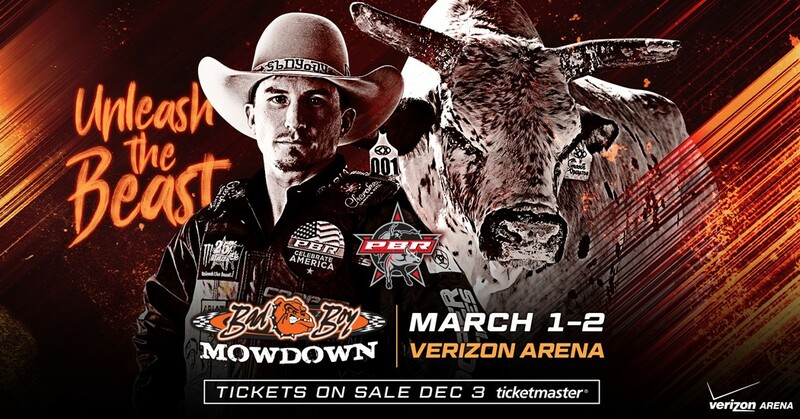 Don’t miss Arkansas native Chase Outlaw, plus other stars of the PBR including Ryan Dirteater, Kaique Pacheco as they fight to beat the clock. It’s two hours of thrills and spills, guaranteed to keep you on the edge-of-yourseat.